Gum (natural) Rubber is a soft non-marking rubber sheet designed for high abrasion resistance and cushioning applications. Gum rubber is resilient with a higher tensile strength than most other synthetic unreinforced rubber materials. It features high rebound elasticity, excellent tear strength and is non-marking as well. Gum rubber makes an excellent chute lining for bulk material transfer, and is resistant to salts and mild acids. Not recommended for outdoor applications with ozone exposure, or in oily environments. 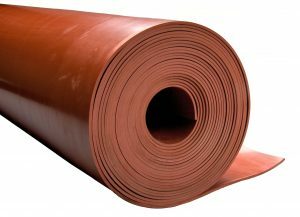 Offered in 36 inch and 48 inch wide rolls, natural gum rubber can also be slit to width or custom cut to your specifications. Gum products may be red or tan in color. Gum tubing also available. Orange Natural Rubber Skirtboard is now available in 48 inch width rolls for a more economical option where pure gum is not required but added abrasion resistance and tensile strength is needed.